Insha'Allah i'll keep you posted about my up-coming trip to Harar on this section of the forum. Stay tuned. Insha'Allah I will be heading to Ethiopia tomorrow. While in Ethiopia I plan to do documentary of the Ethiopian elections, among many other plans that i have. I arrived in Addis Ababa on Sunday Jan. 29th. Monday was a down day for me. The jet lag was tough. For couple of days... i was wide awake around 3am. Now i have adjusted to the time.
? Need for accurate and timely flow of information between Hararis in Harar and the diaspora as means of working together effectively and avoiding inaccurate information. Met with Ato Negash Teklu, the general manager of Walta Information Center. We discussed various means of raising awareness among Ethiopians in diaspora the progresses that are being made by the nation in terms of advancements in democracy and building of infrastructures. Ato Negash gave me a tour of WIC and I must say I was truly impressed with the facilities that they have. Thank you Ato Negash. Insha'Allah the delegation from Toronto and I will meet with the President of the Harari Regional State, his excellency President Murad Abdulhadi and his full cabinet in about a week and a half. I will update you about the meeting, and we will try to make it available to all harari communities abroad. Today I met with H.E. Mr. Fuad Ibrahim, the former President of the Harari Regional State. He is currently working at the Ministry of Education as a General Education State Minister. We discussed various issues including the impressive progress that Ethiopia has undergone in the field of education since the current government has taken over. He gave me several informational booklets that shows the statistical data of the progresses that has been made. We also discussed Harari issues in regards to HNL policies. H.E. Mr. Fuad Ibrahim said the current policy of HNL is the very same one that was advocated by him, and that he is in constant touch with the current President of the Harari Regional State and that they are working closely on Harari issues. I also met with Mr. Fahmi Mawi and discussed the current political situation in Ethiopia, and the need for all progressive Ethiopians to work together for the advancement of the nation. To those of you who requested my mobile number, i should get it by this time tomorrow. It is always great to hear from you since you have great ideas and surprises. Thanks again for such a historic act that you are involved with. With this opportunity I just want to mention one thing that has always been in my mind. 2. Would be the center for the flow information between Harar and the harari diaspora. - Historic books, videos, tapes, cds. - Relgious books, videos, tapes, cds, and so forth. - Regional business Networking magazines, or materials. And so forth, that way most of the Hararies in the diaspora would have one contact center to participate according to their need and interest. Thank you for your input. I will definetly present your proposal to the government officials in Harar. Your proposals, such as the displaying of Harari cultural materials, exists already both in government level (Ada gar) and individual level (Abdullahi Sherif). However, i'll discuss this issue with them in detail and see if they could be merged or other arrangements could be made. I will post my findings here. wel come to ethiopia and Addis i as a new member to this list want to appreciate what you are doing.i want also meet you if possible . Thank you br. Amir. Glad to be home. I will call you and we will arrange a meeting. Today I met with the President of the Harari Regional State, H.E. Muard Abdulhadi, MP Merwan Bedir, along with brother abdurahim Malaq and Br. Fahmi Mawi. We had an extensive discussion on how best to organize the Hararis in diaspora so we can all work towards the greater good of Harar and the Hararis. The discussion was very positive and productive. A complete guidline that is fair and transparent will be drafted soon, and should be available to all Hararis. Insha'Allah (God willing) ... I will be driving to Harar today with my cousin. 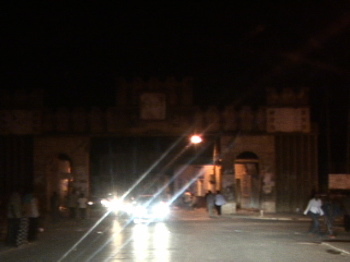 I made it to Harar in one piece on Feb. 16, 2006. I drove to Harar with my cousin. He drove from Addis Ababa to Assebe Teferi, and I drove from Assebe Teferi to Harar. I hit a goat slightly while driving up the hill. The goat was not hurt and managed to continue running. So we decided to continue to drive. However, the lady that was looking after the goats screamed for help. A man appeared infront of us in a threatening manner with a rock in his hand. We had to stop the car. Me and my cousin didn't speak Oromo language so we were clueless as to what was being said. Luckily we had three passengers that did speak Oromo and thus they negotiated with them. Finally the goat was brought and examined. We all agreed no harm was done to it and we continued in our journey. We reached the city of Harar safely around 4:30 pm. I don't think I will look at a goat in a roadway the same way again. You better watch out for them. Feb. 17 Magas Abdulrashid and I met Fahmi's wife at Joglah hospital. 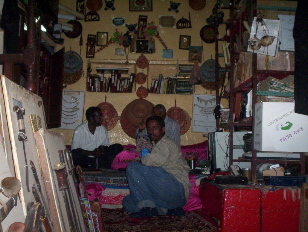 We also went to visit the house museum set up by Abdella Sherif. He really has an amazing collection. Simply amazing. Early in the morning I visited family members. At 11:00 am Mohammed Sourour, Chairperson of HCO, and I along with Magas Abdurashid met with ziamana waldach executives. They gave us a review of how the organization started, their performance since their establishment, and their future plans. 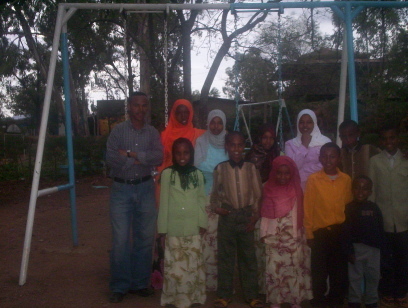 Ziamana Waldach or Amana Children is a grassroots organization that strictly cares for the welfare of orphans in Harar. Currently they are caring for 20 orphans, and ensure that the children are clothed, fed, and properly educated. left is Abdusamed Fandish, the treasurer for the organization. After the meeting Sourour, Magas, and I met with Elias and the Hon. Zeydan Bekri and ate lunch at ?Towfiq Sherif's Restaurant,? or simply known as "Menafasha" .... while there we met Gerado (one of the Hablul singers). We also met Abdulwasi Sherif, another Harari singer who resides in Addis. Towfiq Sherif?s Restaurant serves delicious Harari foods ? including waqalim tibs, hulbat marakh, rice, and meats prepared in various ways. If you go to Harar, you must try this restaurant. During our informal discussion over lunch Zeydan emphasized the need for the Harari public to actively participate in Harari affairs, and not to be spectators. He said the majority usually passes the buck, and that heavy burden usually rests on the shoulders of the few. After lunch Sourour and I had a meeting with the Harari Youth Group. They gave us a summary of how they were formed, their accomplishments, their current conditions, and their future hopes. Both Sourour and I emphasized the need for Harari youth around the globe to link with each other in order to preserve and promote our culture and language. We all agreed that the relationship between the youth groups will be beneficial to Hararis in Harar as well as the Hararis in the diaspora. 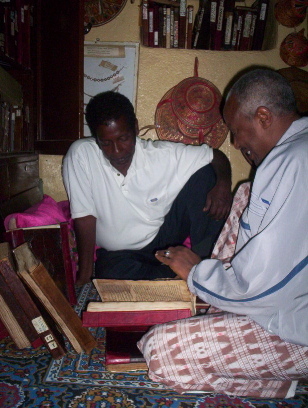 Those in Harar can provide cultural and linguistic assistance, while those in the diaspora can provide latest technology to promote our culture, language and history. The youth group pledged to be proactive in contacting Harari youth groups around the world and to cement a solid relationships with them. After our meeting with the Youth Group, Sourour, Magas and I headed to Abdella Sherif?s private museum. What an amazing collection he has. 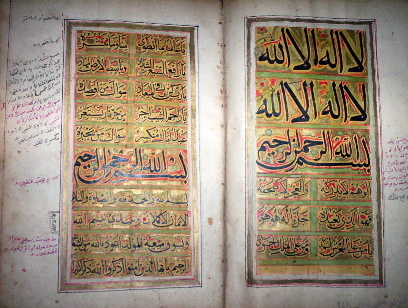 From old Quranic manuscripts to historic documents including Kulub documents. 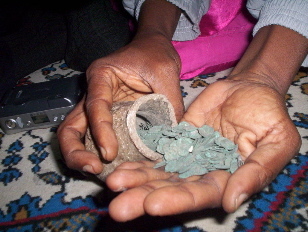 Also, Harari coins, household items, swords, etc. It is beyond description. You must see it to believe it. with Abdella Sherif (R). I am sitting in front. To see part 1 of the video of Sherif Private Museum click here..
To see part 2 of the video of Sherif Private Museum click here..
After taking some pictures, and marveling the amazing collections of the museum, we headed to see the Hyena man around 7:30 pm. We saw the Hyena man feeding the Hyenas with his hands, and sometimes with his mouth. 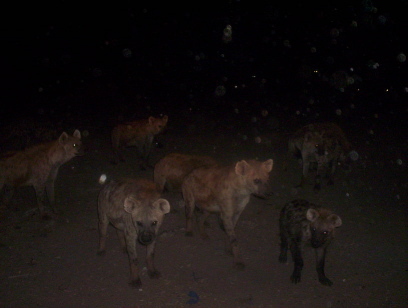 I counted more than 10 Hyenas running around us in all directions. It is a site to behold, where wild beasts can interact in peace with human beings. Maybe there is a lesson in this for those who reflect. If such wild beasts can live and interact with humans in such manner, why can?t we humans do the same with one another? In the words of Rodney King --- "Why can?t we all get along?" Both Sourour and I fed the hyenas with our hands, while Magas shot the video. One doesn?t feel threatened being around them. I noticed the hyenas don?t make eye contacts with people. They are just focused on the food, and thus one can feel safe being around them. It is a strange feeling. The reporter Amir Aqil also accompanied us during our excursion to see the hyenas. He gave introduction about how the hyena feeding tradition started, and then interviewed the hyena man, tourists, as well as br. Sourour for the video documentary that we were diong. God willing I will post it on Malasay one day. After feeding the hyenas we headed to a mountain top to video tape Harar at night. We concluded the night by eating dinner at Aw Waday.